Today marks 10 days until registration for Primary Recruitment closes! Make sure to register by December 31st at 5PM! Visit our website to learn more about our chapters and why you should join! we cant wait to meet you all! Check out our 2019 Recruitment Video! Take a look below at our 2019 Recruitment Video featuring all of our chapters! We cannot wait for Primary Recruitment to begin in the Spring. Please visit our Primary Recruitment page for more info and register now! Registration closes on December 31st at 5 PM! 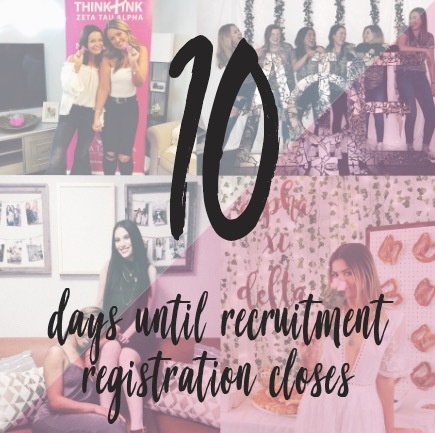 Keep making sure to register for Primary Recruitment! Registration will close on December 31st at 5PM! To register please click here! To learn more about Primary Recruitment please click here. To learn more about our chapters please click here.